With so many water features and fountains for the Australia garden and patio, choosing the right design and style is simple if you follow a few basic steps. Rather than buying the best looking design you see at the first shop start by defining where you wish to make this a show piece. What you will choose for for a large garden will be different to a feature for a courtyard garden where space is limited. Basically all designs are either free standing or designed to be wall mounted, and of course size varies greatly. However in a smaller garden a wall mounted design is an excellent space saving solution. Small free standing designs are also available but think carefully about space. Specialist Rock Installations and Designs are dealt with separately. Two important aspects of installation are the base or platform that the design will sit on, and the availability of power. A firm flat base is essential as they are designed to be installed on level ground. With wall mounted designs, some sit on the ground others are attached to the wall or fence itself, you must ensure that the structure is strong enough to take the weight. In terms of power supply for the pump you have three choices, mains power, low voltage power and solar powered pumps. If you need to install mains powers this will usually be the most expensive option, solar power is cheap however it will not provide power for pumps at night or on cloudy days without a battery back up which will add to the price. Consider installing garden lighting at the same time as it will be cheaper than doing it later and provide visual impact in the evenings. Over time build up of dirt and algae will build up, especially those in the garden where leaf litter and debris can be a problem. A few basic maintenance tips can help keep things working well and looking good. You may notice that the water flow is slowing, often an indication that the pump filter is partially blocked. It might be debris or algae. Algae can be controlled by providing shade, algae needs sun to grow. Changing the water every 4 weeks will also help keep the water clean. And every 3 months give the whole thing a good scrub and clean. 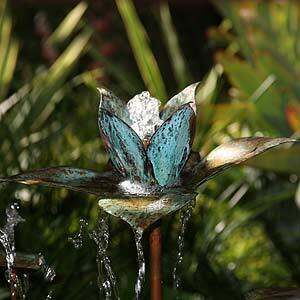 Water features are wonderful additions to any garden, choose the right design, install it properly and keep it clean. Modern designs are needed to add a sense of tranquility to the newly designed courtyard or garden. From a small reflective bowl to a contemporary, slumped glass fountain or natural rock water wall, and all have a place in the garden of today. In many cases you can buy direct from the importer, or manufacturer. And of course, Suppliers in Sydney will vary from local retailers to online suppliers from interstate. Wall mounted designs are popular in Australia. Do it yourself (DIY) projects are possible with low voltage pond pumps available from specialist suppliers. A huge range of underwater and outdoor and garden lighting suitable for highlighting a fountain or pond is also available. 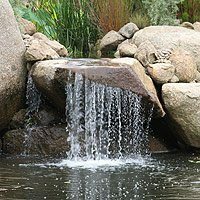 Rock waterfalls for traditional and contemporary gardens. It is possible to build your own. Certainly, you will need a pump, and then the rest is up to you, just about anything can be used to make an individual and unique addition to you garden. 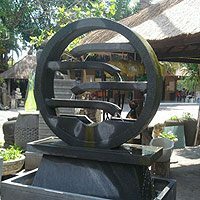 There are 17 Online Water Feature suppliers located with many different design for sale around Australia. If you are looking for a local supplier with a variety of designs for sale in Australia, then this the right section. Our listed Suppliers in Melbourne have a full range of designs for sale direct to the public, that will meet your requirements. Browse and buy online.